The weather was absolutely amazing today. We decided to grill. 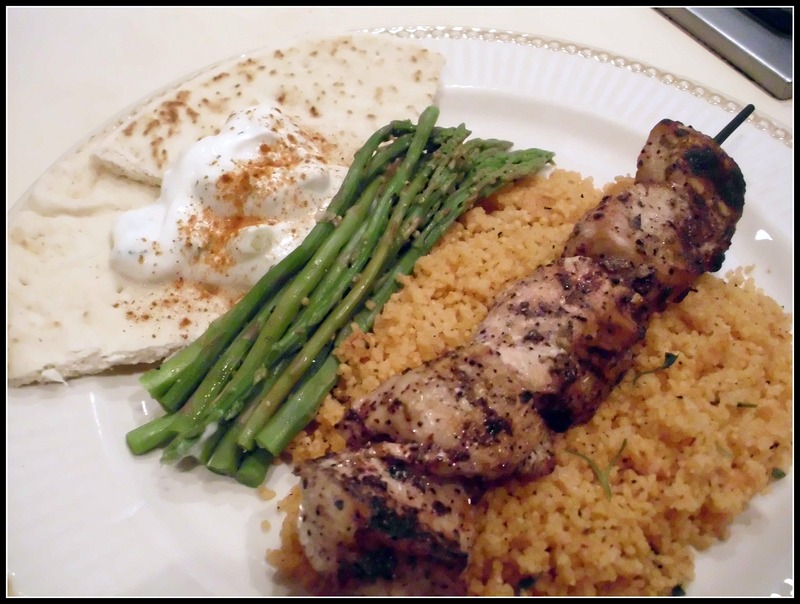 My oldest son loves Greek food so we decided to make Chicken Kabobs and serve them with Tzatziki Sauce, Couscous and steamed Asparagus…. If you don’t use couscous often, you definitely should buy some. It is a very fine pasta that takes only 10 minutes to prepare (definitely a working mom’s “go to”). Below you will find the recipes from our Sunday Dinner. Oh … you are probably wondering what was for dessert… I purchased baklava and strawberries.. (like I said, the weather was gorgeous). Place chicken cubes in a 13×9 shallow baking dish. In a medium bowl, mix together the remaining ingredients. Pour over the chicken and toss to coat chicken. Marinate in the refrigerator for 30-45 minutes. Note: You can substitute White Balsamic Vinegar or Red Wine Vinegar for the Fig Infused White Balsamic Vinegar. Add the water, marinara sauce, olive oil, salt & pepper to a small saucepan. Take off the heat and add the couscous, parsley and parmesan cheese. Cover and let sit for 5 mins. Fluff with a fork. Adjust seasoning as needed. I’ve tried many recipe for Tzatziki. My favorite is Ina Garten’s recipe. Here is a link to the recipe from the Food Network. We just made beef kabobs for dinner tonight but yours look so good! I’ll have to give them a try!